Well, that doesn't work for me. When the slides begin, my screen turns black. The game does not play the scene further. I play with Russian subtitles. What could be the problem? I have no other mods. Please help, I really like this mod. Check out posts from AksJakS from April 13 and before that for possible resolution (use console cheats "ghost" "fly" "walk"). Tell us if it's working for you. And which version of the mod do you use, A or B? I use B version. Sorry, I do not know how to use cheats in the game. So I checked the mod again without cheats. The Hackett speech appeared on a black background and then all of the screenshots appeared in silence. Then the epilogue videos started well. So everything works, even if it is not perfect. Perhaps something was wrong with my previous saves. I heard of this bug, so I chose to use version A instead for my playthrough just in case (maybe the bug will not be present). As for cheats, just press tylde key (~) on your top left side of the keyboard, lower than Esc button: and there you may write: fly. That's a fly cheat, your character should be able to fly. But as you said that it's working, you probably won't need it anyway. Good to know that it works. The problem isn't related to save files as far as anyone knows. It's a bug specific to Version B that has been reported by some dozen people. Unfortunately no fix is coming anytime soon since the author disappearead. 1) To keep using this mod. The speech goes on normally and the slides eventually show up, so it's not a huge loss. 2) Use JAM - Version A. Didn't hear any bugs from that version so far. EDIT: Tried it myself - turns out Version A is equally bugged, with identical problems. 3) If you don't want a "fix the ME3 ending" mod that also needs a fix *and* doesn't like the Catalyst conversation nor MEHEM's cheeseness, I recommend LIME - We Will Prevail as a last, desperate resort. Yes, I keep using this mod. But I tried version A. It works correctly. Probably, I will use LIME for a change. I like both. The mod looks perfect. I replayed the ending three times. Have you managed to fix the black slides? Version B still has a black slides. I don't know how to fix it. But that's okay. Version A works correctly. Probably, I will use version A next time. Or try LIME for a change. Sorry for the late reply. I didn't see your comment. I have a weird problem, the mod works great until hackett starts to talk, I get a dialog with Miranda, speaking about her sister then everything goes back to normal except there is no ambient music during hackett's speech, during the crew scene, my character is invisible and I get a mission critical failure. What am I supposed to do? Hah! I get that exact same issue but using MrFob's MEHEM. 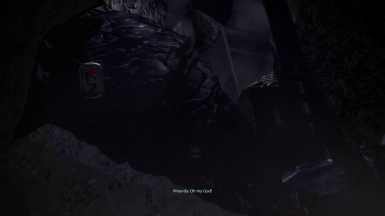 Miranda talks in the strangest place in the ending and then back to Hackett, then the memorial scene which terminates early with a mission critical failure. I'm getting the exact same problem - has anybody worked out why? so I managed to fix it - I had a mod installed called Miranda overhaul mod - can't seem to find it on Nexus anymore. I uninstalled that and started back from the chapter save, just before you enter the beam and JAM worked perfectly. after i deleted the "Miranda Red Shorts Outfit" Mod (DLC_MIR_Shorts) in the dlc folder, it finally worked. thanks to the hint by lisseut. I'm not sure what I did wrong, but this mod never triggered. I got the normal extended cut ending, and as a result CEM didn't trigger afterward. The citadel DLC was suppressed properly, but since JAM never triggered I can't do it now. Oh well. I watched the video so I can pretend like it worked, and I've done the Citadel DLC before, but I was really looking forward to experiencing it again as an epilogue after JAM. Did you AutoTOC after installing any ending mods? Looks like JAM was simply not applied and TOC'd. I'm in the middle of playing through Mass Effect 3 with EGM, Recalibrated and ALOT. I've already done the first half of the Citadel DLC and am a good ways through the second half. Would it be safe to install this now and continue my playthrough from there? I've also heard that installing mods AFTER a lot can cause issues. I'm also livestreaming my playthrough, so it would be awkward to have to restart the entire game just to get a better version of the ending. I install this mod closer to the end of the game and everything worked. I have EGM, Citadel Epilogue Mod, BackOff and Miranda Mod. I recommend you install version A. Version B has slight freezes while loading slides, but they are not critical. Mod can be deleted at any time. It will not affect your save. Sorry for my English. I'm not a native speaker. Just finished my 2nd play of the triology. Thanks you for your mod, Made the game 1000x better. Can anyone confirm if this is compatible with ME3Recalibrated (ME3Re) please? Fully compatible, I believe. They both worked fine on my installation the last time I played. ME3Re is designed to be compatible with other mods, so it doesn't change anything related to the ending, romances, the galaxy map, or Thane. Thank you for the reply. I look forward to another play-through with this mod included. i tried Mehem........for all intents and purposes didn't work for me......(black screens in cutscenes, freezes, etc...) Mehem is a great mod...but not for me, sorry for that! i m very much aware of the limitations in graphics engines and programming, it a passion of mine - intelligent modding the games is the way! but......finally decided to give a go to this mod, and.....honestly in a canonical end of Me3 for, I finally found my peace!!! At the end of game, i was crying !!!! in spite the fact i'm not a kid anymore for a few decades now !!! Sheesh!!! For all the people trying to make mods work i say this: even if you are not making mods, that does not means that is not work and time invested in making a game almost perfect....you need to read thrice if you are not sure....every description at every mod you are using, knowledge using tools for applying, various versions, and above all, passion !!! do not give up ever!!!!! thank you from the bottom of my heart ! Hats down to you! I found a fairly simple fix to the black screen problem in the aftermath slides. Before the slides kick in and before you make your final decision, either while talking to TIM or before the decision with the catalyst, Atl Tab out of the game and go to your save files (documents- bioware- mass effect 3- save) and delete the local save. This is only the part which tells the game which save is the most recent. For some reason this save is causing the problems and without it the slides play perfectly for me. This save will be recreated on the next auto save so no harm done and you can continue on as normal. Hope this helps. N.B. If you want to reload the same character and watch the slides again you'll need to go into that characters save files and remove the Legend save as well. Don't delete this save however, since it does not get replaced. Can you please be more specific, wich exactly is the name of the local save? Quick save, auto save or chapter save. And when exactly i need to delete it, because i installed "B" version of the mod, and that means that Shepard don't talk with the Catalyst. 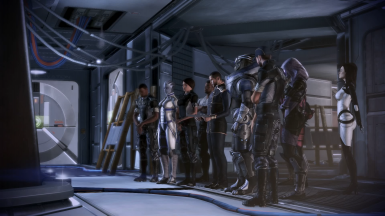 Shepard opens th Citadel, talk with Anderson, and then slides are starting with this damn black screen... Please help me! I'm with you Ecio2014. Which save should be deleted? I also had this problem, so I'd like to know which save file to delete too. Unsure, but he might mean Local_Profile.sav file... Not sure whether it really gets regenerated though, so move it somewhere else for backup. Would be nice if someone could confirm that it works. it auto generates next time you even open the game, if u talking about "local_profile"
and thank you so much for the reply!!! I was talking about file Local_Profile.sav which is located in Save folder. But I got a feeling that he (TezCraig) might have meant AutoSave.pcsav instead, which is located inside Save/your-profile-name folder. So one have to Alt-tab from the game after conversation with TIM and delete one save file. Let's name it the "Alt-Tab and local save delete" solution. Yes, I think your solution with "ghost" "fly" and "walk" console cheats is good and should work for everyone with Version A. But probably not for Version B (no catalyst?). Did anyone tried the solutions mentioned here already? I haven't, but for those with Version B (or A for that matter): use the Extended Final Anderson Conversation mod. It restores cut content made by the developers themselves and adds a final dialogue choice at the end, after TIM dies and before Shepard is called by Hackett about the Crucible not working. It provides a "pause" so you can safely Alt+Tab away to deal with the save file. I will try moving AutoSave.sav away elsewhere later today and will come back to tell you whether it worked. Thanks for the info! Does it appear to work when moving autosave? Unfortunately, moving AutoSave away/excluding it has zero effect. Perhaps he meant Local Profile? EDIT: Tried to move away LegendSave, NewGamePlusSave, AutoSave plus a fourth one I don't recall. Didn't work either; the automatic Destroy ending fired normally, but the Normandy appeared in the weird jungle planet like vanilla. Funnily enough, the black slides bug still happened, and then the memorial scene went normally. I had this and Anderson's extended conversation installed. Once Anderson was done talking and the platform raised, the game cut to an FMV of the Crucible opening up, and then the screen went black and stayed that way while the mellow "Catalyst" music played. It autosaved right when that happened. I thought there may be a conflict with the Extended Anderson Conversation mod, so I closed the game, moved that mod out of the DLC directory, and loaded that autosave out of curiosity. Bizarre result: I was Shepard in the area where you make the final choice...only the Catalyst never showed up, even though I went with Option A. Because I couldn't have that conversation, I couldn't go to either of the areas to pick Control or Destroy, so effectively I was stuck. Thankfully I was able to choose "Restart Mission" in the Load menu, which started me at the part where Shepard limps towards the beam and kills Marauder Shields. I went and played all the way from that til activating the Catalyst...and the black screen thing happened, again even though this was without the Extended Anderson Conversation mod now. I even had the same result upon opening the autosave again. EDIT: I fixed this issue by reinstalling the mod and making sure I didn't have Extended Anderson Conversation just to be safe. That probably wasn't the problem though; I think I might have bought Leviathan after getting this mod, though I don't remember for certain.